The Great Moon Hoax is justly famous for the way the New York Sun and its erstwhile writer, RICHARD ADAMS LOCKE, convinced the public in New York and around the United States that civilization had been found on the moon. This story has been detailed many times, including the book The Sun and the Moon by Matthew Goodman (2008). Edgar Allan Poe, himself a would be moon-hoaxer, described Locke thus in Godey's Lady's Book for October 1846: "Like most men of true imagination, Mr. Locke is a seemingly paradoxical combination of coolness and excitability. He is about five feet seven inches in height, symmetrically formed; there is an air of distinction about his whole person, the air noble of genius. His face is strongly pitted by the smallpox and perhaps, from the same cause there is a marked obliquity in the eyes; a certain, calm, clear luminousness, however, about these latter, amply compensates for the defect, and the forehead is truly beautiful in its intellectuality. I am acquainted with no person possessing so fine a forehead as Mr. Locke. He is married and about forty-five years of age, although no one would suppose him to be more than thirty-eight. He is a lineal descendant of the immortal author of the 'Essay on the Human Understanding.'" The text below comes from an 1859 reprinting the moon hoax stories. I have omitted a lengthy appendix on a geological, geographical, and scientific description of the moon; and I have silently amended some of the more egregious printing errors in the hastily-produced book, but I have retained some of the variant spellings used. 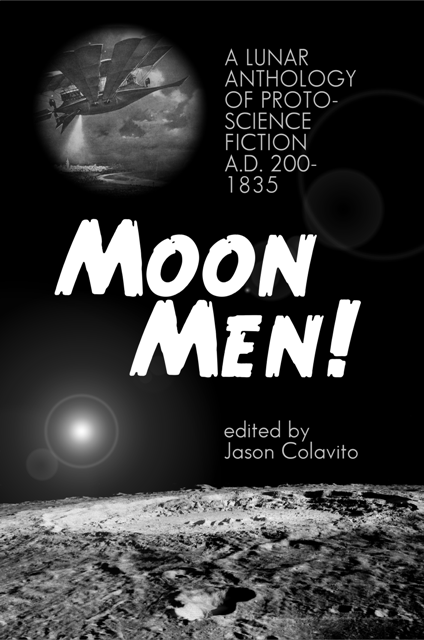 This version of The Moon Hoax is included in my anthology Moon Men! : A Lunar Anthology of Proto-Science Fiction, A.D. 200 to 1835. "The clouds still rested on one hair of It, insomuch that I could discover nothing in it; but the other appeared to me a vast ocean planted with innumerable islands, that were covered with fruits and flowers, and interwoven with a thousand little shining seas that ran among them. I could see persons dressed in glorious habits with garlands upon their heads, passing among the trees, lying down by the sides of fountains, or resting on beds of flowers; and could hear a confused harmony of singing birds, falling waters, human voices, and musical instruments. Gladness grew in me upon the discovery of so delightful a scene. I wished for the wings of an eagle, that I might fly away to those happy seats; but the genius told me there was no passage to them except through the gates of death that I saw opening every moment upon the bridge." It appears to be as natural for the human mind to be craving after the wonderful, the mysterious, the marvellous, and the new discoveries, as it is for the physical appetite to desire food, drink, and sleep, and thereby as it were constantly attempting to lift up the veil that hides incomprehensibilities from our vision. This interposition was, no doubt, wisely ordained, for the gazing upon such mysteries might strike us blind, and rob us of the little stock of happiness allotted to us while probationers here. May this longing not be the germ of the proof of our immortality? The history of the human race is not only filled with instances of this kind of craving, but it is universal, from the loftiest minds as approach nearest the deity, such as Newton, La Place, and Mrs. Somerville, down to the most untutored savage that roams the forest wilds. Hence the key to the popularity of these charming productions which facinate our youth and continue to delight our manhood by letting us into the supposed mysteries of an enchanting fairy land, with a grace of narrative that quite takes us captive, while our curiosity and wonder is raised to the highest pitch in watching the developements unfolded in the narratives of these authors, and quite impatient till we learn the result of the plot, or discovery. I allude to such productions as the Arabian Nights, Sir Thomas More's Utopia, Bishop Berkeley's Adventures of Signior Gaudentio Di Lucca, Swift's Gulliver's Travels, De Foe's Robinson Crusoe, Bunyan's Pilgrim's Progress, and Lord Erskine's Armata, besides numerous others of a similar character but of a less celebrated reputation. Among this class of extraordinary fictitious narratives and supposed discovery, may be placed the renowned Moon Hoax, by Richard Adams Locke. When it first made its appearance from day to day in one of the morning papers, the interest in the discovery was intense, so much so that the circulation of the paper augmented five fold, and in fact, was the means of giving the journal a permanent footing as a daily newspaper. Nor did this multiplied circulation of the paper satisfy the public appetite. The proprietors of the journal had an edition of 60,000 published in pamphlet form, which were sold off in less than one month; and of late this pamphlet edition has become so scarce that a single copy was lately sold at the sale of Mr. Haswell’s Library for $3.75. The book is still in demand. As an instance of this the following will give some idea at what pains and cost some will go to procure it. I lately had a letter from a Gentleman residing in "Wisconsin, making inquiry if I had such a book, he further informed me that his attention had been called to my book establishment in consequence of having sent to the Sunday Times, published in this city, the following query, "Can you inform me if such a book can be procured, and if so where, as 'The celebrated Moon Hoax?'" The answer was that if it could be procured at all, it would be at 85 Centre Street, New York. By this circuitous method, this dilligent far-west book-collector procured his copy of the "Moon Hoax" to his great satisfaction. GREAT ASTRONOMICAL DISCOVERIES LATELY MADE BY SIR JOHN HERSCHEL, L.L., D.F.R.S., &c, AT THE CAPE OF GOOD HOPE. In this unusual addition to our Journal, we have the happiness of making known to the British public, and thence to the whole civilized world, recent discoveries in Astronomy which will build an imperishable monument to the age in which we live, and confer upon the present generation of the human race a proud distinction through all future time. It has been poetically said, that the stars of heaven are the hereditary regalia of man, as the intellectual sovereign of the animal creation. He may now fold the Zodiack around him with a loftier consciousness of his mental supremacy. It is impossible to contemplate any great Astronomical discovery without feelings closely allied to a sensation of awe, and nearly akin to those with which a departed spirit may be supposed to discover the realities of a future state. Bound by the irrevocable laws of nature to the globe on which we live, creatures " close shut up in infinite expanse," it seems like acquiring a fearful supernatural power when any remote mysterious works of the Creator yield tribute to our curiosity. It seems almost a presumptuous usurpation of powers denied us by the divine will, when man, in the pride and confidence of his skill, steps forth, far beyond the apparently natural boundary of his privileges, and demands the secrets and familiar fellowship of other worlds. We are assured that when the immortal philosopher to whom mankind is indebted for the thrilling wonders now first made known, had at length adjusted his new and stupendous apparatus with a certainty of success, he solemnly paused several hours before he commenced his observations, that he might prepare his own mind for discoveries which he knew would fill the minds of myriads of his fellow-men with astonishment, and secure his name a bright, if not transcendant conjunction with that of his venerable father to all posterity. And well might he pause! From the hour the first human pair opened their eyes to the glories of the blue firmament above them, there has been no accession to human knowledge at all comparable in sublime interest to that which he has been the honored agent in supplying, and we are taught to believe that, when a work, already preparing for the press, in which his discoveries are embodied in detail, shall be laid before the public, they will be found of incomparable importance to some of the grandest operations of civilized life. "Well might he pause! He was about to become the sole depository of wondrous secrets which had been hid from the eyes of all men that had lived since the birth of time. He was about to crown himself with a diadem of knowledge which would give him a conscious pre-eminence above every individual of his species who then lived, or who had lived in the generations that are passed away. He paused ere he broke the seal of the casket which contained it. To render our enthusiasm intelligible, we will state at once, that by means of a telescope of vast dimensions and an entirely new principle, the younger Herschel, at his observatory in the Southern Hemisphere, has already made the most extraordinary discoveries in every planet of our solar system; has discovered planets in other solar systems; has obtained a distinct view of objects in the moon, fully equal to that which the unaided eye commands of terrestrial objects at the distance of a hundred yards ; has affirmatively settled the question whether this satellite be inhabited, and by what order of beings; has firmly established a new theory of cometary phenomena; and has solved or corrected nearly every leading problem of mathematical astronomy. For our early and almost exclusive information concerning these facts, we are indebted to the devoted friendship of Dr. Andrew Grant, the pupil of the elder, and for several years past the inseperable coadjutor of the younger Herschel. The amanuensis of the latter at the Cape of Good Hope, and the indefatigable superintendent of his telescope during the whole period of its construction and operation, Dr. Grant has been enabled to supply us with intelligence equal, in general interest at least, to that which Dr. Herschel himself has transmitted to the Royal Society. Indeed our correspondent assures us that the voluminous documents now before a committee of that institution contain little more than details and mathematical illustrations of the facts communicated to us in his own ample correspondence. For permission to indulge his friendship in communicating this invaluable information to us, Dr. Grant and ourselves are indebted to the magnanimity of Dr. Herschel, who, far above all mercenary considerations, has thus signally honored and rewarded his fellow-laborer in the field of science. The engravings of lunar animals and other objects, and of the phases of the several planets, are accurate copies of drawings taken in the observatory by Herbert Home, Esq., who accompanied the last powerful series of reflectors from London to the Cape, and superintended their erection; and he has thus recorded the proofs of their triumphant success. The engravings of the belts of Jupiter is a reduced copy of an imperial folio drawing by Dr. Herschel himself, and contains the results of his latest observation of that planet. The segment of the inner ring of Saturn is from a large drawing by Dr. Grant. We first avail ourselves of the documents which contain a description and history of the instrument by which these stupendous discoveries have been made. A knowledge of the one is essential to the credibility of the other. It is well known that the great reflecting telescope of the late elder Herschel, with an object-glass four feet in diameter, and a tube forty feet in length, possesses a magnifying power of more than six thousand times. But a small portion of this power was ever advantageously applied to the nearer astronomical objects; for the deficiency of light from objects so highly magnified, rendered them less distinct than when viewed with a power of a third or fourth of this extent. Accordingly the powers which he generally applied when observing the moon or planets, and with which he made his most interesting discoveries, ranged from 220, 460, 750, and 900 times ; although, when inspecting the double and treble fixed stars, and the more distant nebulae, he frequently applied the full capacity of his instrument. The law of optics, that an object becomes dim in proportion as it is magnified, seemed, from its exemplification in this powerful telescope, to form an insuperable boundary to further discoveries in our solar system. Several years, however, prior to the death of this venerable astronomer, he conceived it practicable to construct an improved series of parabolic and spherical reflectors, which, by uniting all the meritorious points in the Gregorian and Newtonian instruments, with the highly interesting achromatic discovery of Dolland, would, to a great degree, remove the formidable obstruction. His plan evinced the most profound research in optical science, and the most dexterous ingenuity in mechanical contrivance ; but accumulating infirmities, and eventually death, prevented its experimental application. His son, the present Sir John Herschel, who had been nursed and cradled in the observatory, and a practical astronomer from his boyhood, was so fully convinced of the value of the theory, that he determined upon testing it, at whatever cost. "Within two years of his father's death he completed his new apparatus, and adapted it to the old telescope with nearly perfect success. He found that the magnifying power of 6,000 times, when applied to the moon, which was the severest criterion that could be selected, produced, under these new reflectors, a focal object of exquisite distinctness, free from every achromatic obscurity, and containing the highest degree of light which the great speculum could collect from that luminary. The enlargement of the angle of vision which was thus acquired, is ascertained by dividing the moon's distance from the observatory by the magnifying power of the instrument; and the former being 240,000 miles, and the latter 6,000 times, leaves a quotient of 40 miles as the apparent distance of that planet from the eye of the observer. Now it is well known that no terrestrial objeets can be seen at a greater distance than this, with the naked eye, even from the most favorable elevations. The rotundity of the earth prevents a more distant view than this with the most acute natural vision, and from the highest eminences ; and, generally, objects seen at this distance are themselves elevated on mountainous ridges. It is not pretended, moreover, that this forty miles telescopic view of the moon presented its objects with equal distinctness, though it did in equal size to those of this earth, so remotely stationed. The elder Herschel had nevertheless demonstrated, that with a power of 1,000 times, he could discern objects in this satellite of not more than 122 yards in diameter. If therefore the, full capability of the instrument had been elicited by the newapparatus of reflectors constructed by his son, it would follow,, in mathematical ratio, that objects could be discerned of aptmore than 22 yards in diameter. Yet in either case they would be seen as mere feeble, shapeless points, with no greater conspicuity than they would exhibit upon earth to the unaided eye at the distance of forty miles. But although the rotundity of the earth presented no obstruction to a view of these astronomical objects, we believe Sir John Herschel never insisted that he had carried out these extreme powers of the telescope in so full a ratio. The deficiency of light, though greatly economised and concentrated, still maintained some inverse proportion to the magnitude of the focal image. The advance he had made in the knowledge of this planet, though magnificent and sublime, was thus but partial and unsatisfactory. He was, it is true, enabled to confirm some discoveries of former observers, and to confute those of others. The existence of volcanoes discovered by his father and by Scbroeter of Berlin, and the changes observed by the latter in the volcano in the Mare Urisium or Lucid Lake, were corroborated and illustrated, as was also the prevalence of far more extensive volcanic phenomena. The disproportionate height attributed to the lunar mountains was corrected from careful admeasurement; whilst the celebrated conical hills, encircling valleys of vast diameter, and surrounding the lofty central hills, were distinctly perceived. The formation which Professor Frauenhofer unchari tably conjectured to be a lunar fortification, he ascertained to be a tabular buttress of a remarkably pyramidical mountain; lines which had been whimsically pronounced roads and canals, he found to be keen ridges of singularly regular rows of hills ; and that which Schroeter imagined to be a great eity in the neighborhood of Marius, he determined to be a valley of disjointed rocks scattered in fragments, which averaged at least a thousand yards in diameter. Thus the general geography of the planet, in its grand outlines of cape, continent, mountain, ocean, and island, was surveyed with greater particularity and accuracy than by any previous observer; and the striking dissimilarity of many of its local features to any existing on our own globe, was clearly demonstrated. The best enlarged maps of that luminary which have been published were constructed from this survey; and neither the astronomer nor the public ventured to hope for any great accession to their developments. The utmost power of the largest telescope in the world had been exerted in a new and felicitous manner to obtain them, and there was no reasonable expectation that a larger one woidd ever be constructed, or that it could be advantageously used if it were. A law of nature, and the finitude of human skill, seemed united in inflexible opposition to any further improvement in telescopic science, as applicable to the known planets and satellites of the solar system. For unless the sun could be prevailed upon to extend a more liberal allowance of light to these bodies, and they be induced to transfer it, for the generous gratification of our curiosity, what adequate substitute could be obtained ? Telescopes do not create light, they cannot even transmit unimpaired that -which they receive. That anything further could be derived from human skill in the construction of instruments, the labors of his illustrious predecessors, and his own, left the son of Herschel no reason to hope. Huygens, Fontana, Gregory, Newton, Hadley, Bird, Short, Dolland, Herschel, and many others, all practical opticians, had resorted to every material in any wise adapted to the composition either of lenses or reflectors, and had exhausted every law of vision which study had developed and demonstrated. In the construction of his last amazing specula, Sir John Herschel had selected the most approved amalgams that the advanced stage of metallic chemistry had combined ; and had watched their growing brightness under the hands of the artificer with more anxious hope than ever lover watched the eye of his mistress ; and he had nothing further to expect than they had accomplished. He had the satisfaction to know that if he could leap astride a cannon ball, and travel upon its wings of fury for the respectable period of several millions of years, he would not obtain a more enlarged view of the distant stars than he could now possess in a few minutes of time ; and that it would require an ultra-railroad speed of fifty miles an hour, for nearly the live-long year, to secure him a more favorable inspection of the gentle luminary of night. The interesting question, however, whether this light of the solemn forest, of the treeless desert, and of the deep blue ocean as it rolls; whether this object of the lonely turret, of the uplifted eye on the deserted battle-field, and of all the pilgrims of love and hope, of misery and despair, that have journeyed over the hills and valleys of this earth, through all the eras of its unwritten history to those of its present voluminous record; the exciting question, whether this " observed " of all the sons of men, from the days of Eden to those of Edinburgh, be inhabited by beings like ourselves, of consciousness and curiosity, was left for solution to the benevolent index of natural analogy, or to the severe tradition that it is tenanted only by the hoary solitaire whom the criminal code of the nursery had banished thither for collecting fuel on the Sabbath-day. The limits of discovery in the planetary bodies, and in this one especially, thus seemed to be immutably fixed; and no expectation was elevated for a period of several years. But, about three years ago, in the course of a conversational discussion with Sir David Brewster upon the merits of some ingenious suggestions by the latter, in his article on optics in the Edinburgh Encyclopedia (p. 644), for improvements in the Newtonian Reflectors, Sir John Herschel adverted to the convenient simplicity of the old astronomical telescopes that were without tubes, and the object-glass of which, placed upon a high pole, threw its focal image to a distance of 150, and even 200 feet. Dr. Brewster readily admitted that a tube was not necessary, provided the focal image were conveyed into a dark apartment, and there properly received by reflectors. Sir John then said that, if his father's great telescope, the tube alone of which, though formed of the lightest suitable materials, weighed 3,000 lbs., possessed an easy and steady mobility with its heavy observatory attached, an observatory moveable without the incumbrance of such a tube, was obviously practical. This also was admitted, and the conversation became directed to that allinvincible enemy. The paucity of light in powerful magnifiers. After a few moments' silent thought, Sir John diffidently inquired whether it would not be possible to effect a transfusion of artificial light through the focal object of vision ! Sir David, somewhat startled at the originality of the idea, paused awhile, and then hesitatingly referred to the refrangibility of rays, and the angle of incidence. Sir John, grown more confident, adduced the example of the Newtonian Reflector, in which the refrangibility was corrected by the second speculum, and the angle of incidence restored by the third. "And," continued he, "why cannot the illuminated microscope, say the hydrooxygen, be applied to render distinct, and, if necessary, even to magnify the focal object ?" Sir David sprung from his chair in an ecstacy of conviction, and leaping half-way to the ceiling, exclaimed, "Thou art the man !" Each philosopher anticipated the other in presenting the prompt illustration that if the rays of the hydro-oxygen microscope, passed through a drop of water containing the larvae of a gnat and other objects invisible to the naked eye, rendered them not only keenly but firmly magnified to dimensions of many feet; so could the satne artificial light, passed through the faintest focal object of a telescope, both distinctify (to coin a new word for an extraordinary occasion) and magnify its feeblest component members. The only apparent desideratum was a recipient for the focal image which should transfer it, without refranging if, to the surface on which it was to be viewed under the revivifying light of the microscopic reflectors. In the various experiments made during the few following weeks, the co-operative philosophers decided that a medium of the purest plate glass (which it is said they obtained, hy consent, be it observed, from the shop window of Mons. Desanges, the jeweller to his ex-majesty Charles X., in High street) was the most eligible they could discover. It answered perfectly with a telescope which magnified 100 times, and a microscope of about thrice that power. Sir John Herschel then conceived the stupendous fabric of his present telescope. The power of his father's instrument would still leave him distant from his favorite planet nearly forty miles, and he resolved to attempt a greater magnifier. Money, the wings of science as the sinews of war, seemed the only requisite, and even the acquisition of this, which is often more difficult than the task of Sisyphus, he determined to achieve. Fully sanctioned by the high optical authority of Sir David Brewster, he laid his plan before the Royal Society, and particularly directed to it the attention of His Royal Highness the Duke of Sussex, the ever munificent patron of science and the arts. It was immediately and enthusiastically approved by the committee chosen to investigate it, and the chairman, who was the Royal President, subscribed his name for a contribution of £10,000, with a promise that he would zealously submit the proposed instrument as a fit object for the patronage of the privy purse. He did so without delay, and his Majesty, on being informed that the estimated expense was £70,000, naively inquired if the costly instrument would conduce to any improvement in navigation? On being informed that it undoubtedly would, the sailor King promised a carte blanch for the amount which might be required. Sir John Herschel had submitted his plans and calculations in adaptation to an object-glass of twenty-four feet in diameter: just six times the size of his venerable father's. For casting this ponderous mass, he selected the large glass-house of Messrs. Hartly and Grant, (the brother of our invaluable friend Dr. Grant) at Dumbarton. The material chosen was an amalgamation of two parts of the best crown with one of flint glass, the use of which, in separate lenses, constituted the great achromatic discovery of Dolland. It had been found, however, by accurate experiments, that the amalgam would as completely triumph over every impediment, both from refrangibility and discoloration, as the separate lenses. Five furnaces of the metal, carefully collected from productions of the manufactory, in both the kinds of glass, and known to be respectively of nearly perfect homogenous quality, were united, by one grand conductor, to the mould; and on the third of January, 2833, the first cast was effected. After cooling eight days, the mould was opened, and the glass found to be greatly flawed within eighteen inches of the centre. Notwithstanding this failure, a new glass was more carefully cast on the 27th ©f the same month, which on being opened during the first week of February, was found to be immaculately perfect, with the exception of two slight flaws so near the line of its circumference that they would be covered by the copper ring in which it was designed to be enclosed. The weight of this prodigious lens was 14,826 lbs. or nearly seven tons after being polished ; and its estimated magnifying power 42,000 times. It was therefore presumed to be capable of representing objects in onr lunar satellite of little more than eighteen inches in diameter, provided its focal image of them could be rendered distinct by the transfusion of artificial light. It was not, however, upon the mere illuminating power of the hydro-oxygen microscope, as applied to the focal pictures of this lens, that the younger Herschel depended for the realization of his ambitions theories and hopes. He calculated largely upon the almost illimitable applicability of this instrument as a second magnifier, which would supersede the use, and infinitely transcend the powers of the highest magnifiers in reflecting telescopes. So sanguinely indeed did he calculate upon the advantages of this splendid alliance, that he expressed confidence in his ultimate ability to study even the entomology of the moon, in case she contained insects upon her surface. Having witnessed the completion of this great lens, and its safe transportation to the metropolis, his next care was the construction of a suitable microscope, and of the mechanical frame-work for the horizontal and vertical action of the whole. His plans in every branch of his undertaking having been intensely studied, even to their minutest details, were easily and rapidly executed. He awaited only the appointed period at which he was to convey his magnificent apparatus to its destination. A correspondence had for some time passed between the Boards of England, France, and Austria, with a view to improvements in the tables of longitude in the southern hemisphere ; which are found to be much less accurate than those of the northern. The high opinion entertained by the British Board of Longitude of the principles of the new telescope, and of the profound skill of its inventor, determined the government to solicit his services in observing the transit of Mercury over the sun's disk, which will take place on the 7th of November in the present year : and which, as it will occur at 7h. 47m. 55s. night, conjunction, meantime ; and at 8h. 12m. 22s. middle, true time, will be invisible to nearly all the northern hemisphere. The place at which the transits of Mercury and of Yenus have generally been observed by the astronomers of Europe, when occurring under these circumstances, is the Cape of Good Hope; and no transit of Yenus having occurred since the year 1769, and none being to occur before 1874, the accurate observation of the transits of Mercury, which occur more frequently, has been found of great importance both to astronomy and navigation. To the latter useful art, indeed, the transits of Mercury are nearly as important as those of Yenus; for although those of the latter planet have the peculiar advantage of determining exactly the great solar parallax, and thence the distances of all the planets from the sun, yet thetransits of Mercury, by exactly determining the place of its own node, independently of the parallax of the great orb, determine the parallax of the earth and moon; and are therefore especially valuable in lunar observations of Longitude. The Cape of Good Hope has been found preferable, in these observations, to any other station in the hemisphere. The expedition which went to Peru, about the middle of the last century, to ascertain, in conjunction with another in Lapland, the true figure of the earth, found the attraction of the mountainous regions so strong as to cause the plum-line of one of their large instruments to deflect seven or eight seconds from the true perpendicular ; whilst the elevated plains at the Cape unite all the advantages of a lucid atmosphere with an entire freedom from mountainous obstruction. Sir John Herschel, therefore, not only accepted the appointment with high satisfaction, but requested that it might commence at least a year before the period of the transit, to afford him time to bring his ponderous and complicated machinery into perfect adjustment, and to extend his knowledge of the southern constellations. His wish was immediately assented to, and his arrangements being completed, he sailed from London on the 4th of September, 1834, in company with Dr. Andrew Grant, Lieutenant Drummond, of the Koyal Engineers, F.K.A.S., and a large party of the best English mechanics. They arrived, after an expeditious and agreeable passage, and immediately proceeded to transport the lens, and the frame of the large observatory, to its destined site, which was a piece of table-land of great extent and elevation, about thirty-five miles to the north-east of Capetown ; and which is said to be the very spot on which De la Caille, in 1750, constructed his invaluable solar tables, when he measured a degree of the meridian, and made a great advance to exactitude in computing the solar parallax from that of Mars and the Moon. Sir John accomplished the ascent to the plains by means of two relief teams of oxen, of eighteen each, in about four days; and, aided by several companies of Dutch boors, proceeded at once to the erection of his gigantic fabric. The ground plan of the structure is in some respects similar to that of the Herschel telescope in England, except that instead of circular foundations of brickwork, it consists of parallel circles of railroad iron, upon wooden framework; so constructed that the turn-outs, or rather turn-ins, from the largest circle, will conduct the observatory, which moves upon them, to the innermost circle, which is the basis of the lensworks ; and to each of the circles that intervene. The diameter of the smallest circle is twenty-eight feet: that of the largest our correspondent has singularly forgotten to state, though it may be in some measure computed from the angle of incidence projected by the lens, and the space occupied by the observatory. The latter is a wooden building fifty feet square and as many high, with a flat roof and gutters of thin copper. Through the side proximate to the lens, is an aperture four feet in diameter to receive its rays, and through the roof another for the same purpose in meridional observations. The lens, which is inclosed in a frame of wood, and braced to its corners by bars of copper, is suspended upon an axis between two pillars which are nearly as high as those which supported the celebrated quadrant of Uleg Beg, being one hundred and fifty feet. These are united at the top and bottom by cross-pieces, and strengthened by a number of diagonal braces ; and between them is a double capstan for hoisting the lens from its horizontal line with the observatory to the height required by its focal distance when turned to the meridian; and for elevating it to any intermediate degree of altitude that may be needed. This last operation is beautifully regulated by an immense double sextant, which is connected and moves with the axis of the lens, and is regularly divided into degrees, minutes, and seconds; and the horizontal circles of the observatory being also divided into 360 degrees, and minutely subdivided, the whole instrument has the powers and regularity of the most improved theodolite. Having no tube, it is connected with the observatory by two horizontal levers, which pass underneath the floor of that building from the circular basis of the pillars ; thus keeping the lens always square with the observatory, and securing to both a uniform and simple movement. By means of these levers, too, a rack and windlass, the observatory is brought to any degree of approximation to the pillars that the altitude of an observation may require ; and although, when at its nearest station it cannot command an observation with tlie great lens within about fifteen degrees of the meridian, it is supplied with an excellent telescope of vast power, constructed by the elder Herschel, by which every high degree can be surveyed. The field of view, therefore, whether exhibited on the floor or on the wall of the apartment, has a diameter of nearly fifty feet, and, being circular, it has therefore an area of nearly 1875 feet. The place of all the horizontal movements having been accurately levelled by Lieut. Drummond, with the improved level of his invention which bears his name, and the wheels both of the observatory and of the lens-works being facilitated by friction-rollers in patent axle-boxes filled with oil, the strength of one man applied to the extremity of the levers is sufficient to propel the whole structure upon either of the railroad circles ; and that of two men applied to the windlass is fully adequate to bring the observatory to the basis of the pillars. Both of these movements, however, are now effected by a locomotive apparatus commanded within the apartment by a single person, and showing, by means of an ingenious index, every inch of progression or retrogression. We have not thus particularly described the telescope of the younger Herschel because we consider it the most magnificent specimen of philosophical mechanism of the present or any previous age, but because we deemed an explicit description of its principles and powers an almost indispensable introduction to a statement of the sublime expansion of human knowledge which it has achieved. It was not fully completed until the latter part of December, when the series of large reflectors for the microscope arrived from England; and it was brought into operation during the first week of the ensuing month and year. But the secresy which had been maintained with regard to its novelty, its manufacture, and its destination, was not less rigidly preserved for several months respecting the grandeur of its success. Whether the British Government were sceptical concerning the promised splendor of its discoveries, or wished them to be scrupulously veiled until they had accumulated a a full-orbed glory for the nation and reign in which they origi nated, is a question which we can only conjecturally solve. But certain it is that the astronomer's royal patrons enjoined a masonic taciturnity upon him and his friends until he should have officially communicated the results of his great experiment. Accordingly, the world heard nothing of him or his expedition until it was announced a few months since in the scientific journals of Germany, that Sir John Herschel, at the Cape of Good Hope, had written to the astronomer-royal of Yienna, to inform him that the portentous comet predicted for the year 1835, which was to approach so near this trembling globe that we might hear the roaring of its fires, had turned upon another scent, and would not even shake a hair of its tail upon our hunting-grounds. At a loss to conceive by what extra authority he had made so bold a declaration, the men of science in Europe who were not acquainted with his secret, regarded his "postponement," as his discovery was termed, with incredulous contumely, and continued to terrorize upon the strength of former predictions. Until the 10th of January, the observations were chiefly directed to the stars in the southern signs, in which, without the aid of the hydro-oxygen reflectors, a countless number of new stars and nebulae were discovered. But we shall defer our correspondent's account of these to future pages, for the purpose of no longer withholding from our readers the more generally and highly interesting discoveries which were made in the lunar world. And for this purpose, too, we shall defer Dr. Grant's elaborate mathematical details of the corrections which Sir John Herschel has made in the best tables of the moon's tropical, sidereal, and synodic revolutions, and of those phenomena of syzygies on which a great part of the established lunar theory depends. It was about half-past nine o'clock on the night of the 10th, the moon having then advanced within four days of her mean libration, that the astronomer adjusted his instruments for the inspection of her eastern limb. The whole immense power of his telescope was applied, and to its focal image about one half of the power of his microscope. On removing the screen of the latter, the field of view was covered throughout its entire area with a beautifully distinct, and even vivid representation of basaltic rock. Its color was a greenish brown, and the width of the columns, as defined by their interstices on the canvass, was invariably twenty-eight inches. No fracture whatever appeared in the mass first presented, but in a few seconds a shelving pile appeared of five or six columns width, which showed their figure to be hexagonal, and their articulations similar to those of the basaltic formation at Staffa. This precipitous shelf was profusely covered with a dark red flower, " precisely similar," says Dr. Grant, " to the Papaver Rhoeas, or rose-poppy of our sublunary cornfields; and this was the first organic production of nature, in a foreign world, ever revealed to the eyes of men." The rapidity of the moon's ascension, or rather of the earth's diurnal rotation, being nearly equal to five hundred yards in a second, would have effectually prevented the inspection, or even the discovery of objects so minute as these, but for the admirable mechanism which constantly regulates, under the guidance of the sextant, the required altitude of the lens. But its operation was found to be so consummately perfect, that the observers could detain the object upon the field of view for any period they might desire. The specimen of lunar vegetation, however, which they had already seen, had decided a question of too exciting an interest to induce them to retard its exit. It had demonstrated that the moon has an atmosphere constituted similarly to our own, and capable of sustaining organized, and therefore, most probably, animal life. The basaltic rocks continued to pass over the inclined canvass plane, through three successive diameters, when a verdant declivity of great beauty appeared, which occupied two more. This was preceded by another mass of nearly the former height, at the base of which they were at length delighted to perceive that novelty, a lunar forest. "The trees," says Dr. Grant, " for a period of ten minutes, were of one unvaried kind, and unlike any I have seen, except the largest kind of yews in the English churchyards, which they in some respects resemble. These were followed by a level green plain, which, as measured by the painted circle on our canvass of forty-nine feet, must have been more than half a mile in breadth ; and then appeared as fine a forest of firs, unequivocal firs, as I have ever sean cherished in the bosom of my native mountains. "Wearied with the long continuance of these, we greatly reduced the magnifying power of the microscope, without eclipsing either of the reflectors, and immediately perceived that we had been insensibly descending, as it were, a mountainous district of a highly diversified and romantic character, and that we were on the verge of a lake, or inland sea ; but of what relative locality or extent, we were yet too greatly magnified to determine. On introducing the feeblest acromatic lens we possessed, we found that the water, whose boundary we had just discovered, answered in general outline to the Mare Nubium of Riccoli, by which we detected that, instead of commencing, as we supposed, on the eastern longitude of the planet, some delay in the elevation of the great lens had thrown us nearly upon the axis of her equator. However, as she was a free country, and we not, as yet, attached to any particular province, and moreover, since we could at any moment occupy our intended position, we again slid in our magic lenses to survey the shores of the Mare Nubium. Why Riccoli so termed it, unless in ridicule of Cleomedes, I know not; for fairer shores never angels coasted on a tour of pleasure. A beach of brilliant white sand, girt with wild castellated rocks, apparently of green marble, varied at chasms, occurring every two or three hundred feet, with grotesque blocks of chalk or gypsum, and feathered and festooned at the summit with the clustering foliage of unknown trees, moved along the bright wall of our apartment until we were speechless with admiration. The water, wherever we obtained a view of it, was nearly as blue as that of the deep ocean, and broke in large white billows upon the strand. The action of very high tides was quite manifest upon the face of the cliffs for more than a hundred miles; yet diversified as the scenery was during this and a much greater distance, we perceived no trace of animal existence, notwithstanding we could command at will a perspective or a foreground view of the whole. Mr. Holmes, indeed, pronounced some white objects of a circular form, which we saw at some distance in the interior of a cavern, to be bona fide specimens of a largQ cornu ammonis; but to me they appeared merely large pebbles, which had been chafed and rolled there by the tides. Our chase of animal life was not yet to be rewarded. Having continued this close inspection nearly two hours, during which we passed over a wide tract of country, chiefly of a rugged and apparently volcanic character; and having seen few additional varieties of vegetation, except some species of lichen, which grew everywhere in great abundance, Dr. Herschel proposed that we should take out all our lenses, give a rapid speed to the panorama, and search for some of the principal valleys known to astronomers, as the most likely method to reward our first night's observation with the discovery of animated beings. The lenses being removed, and the effulgence of our unutterably glorious reflectors left undiminished, we found, in accordance with our calculations, that our field of view comprehended about twenty-five miles of the lunar surface, with the distinctness both of outline and detail which could be procured of a terrestrial object at the distance of two and a half miles; an optical phenomenon which you will find demonstrated in Note 5. This afforded us the best landscape views we had hitherto obtained, and although the accelerated motion was rather too great, we enjoyed them with rapture. Several of those famous valleys, which are bounded by lofty hills of so perfectly conical a form as to render them less like works of nature than of art, passed the canvass before we had time to check their flight; but presently a train of scenery met our eye, of features so entirely novel, that Dr. Herschel signalled for the lowest convenient gradation of movement. It was a lofty chain of obelisk-shaped, or very slender pyramids, standing in irregular groups, each composed of about thirty or forty spires, every one of which was perfectly square, and as accurately truncated as the finest specimens of Cornish crystal. They were of a faint lilac hue, and very resplendent. I now thought that we had assuredly fallen on productions of art; hut Dr. Herschel shrewdly remarked, that if the Lunarians could build thirty or forty miles of such monuments as these, we should ere now have discovered others of a less equivocal character. He pronounced them quartz formations, of probably the wine-colored amethyst species, and promised us, from these and other proofs which he had obtained of the powerful action of laws of crystallization in this planet, a rich field of mineralogical study. On introducing a lens, his conjecture was fully confirmed ; they were monstrous amethysts, of a diluted claret color, glowing in the intensest light of the sun ! They varied in height from sixty to ninety feet, though we saw several of a still more incredible altitude. They were observed in a succession of valleys divided by longitudinal lines of round-breasted hills, covered with verdure and nobly undulated; but what is most remarkable, the valleys which contained these stupendous crystals were invariably barren, and covered with stones of a ferruginous hue, which were probably iron pyrites. We found that some of these curiosities were situated in a district elevated half a mile above the valley of the Mare Foecunditatis, of Mayer and Riccioli; the shores of which soon hove in view. But never was a name more inappropriately bestowed. From " Dan to Beersheba " all was barren, barren—the sea-board was entirely composed of chalk and flint, and not a ve6tige of vegetation could be discovered with our strongest glasses. The whole breadth of the northern extremity of this sea, which was about three hundred miles, having crossed our plane, we entered upon a wild mountainous region abounding with more extensive forests of larger trees than we had before seen—the species of which I have no good analogy to describe. In general contour they resembled our forest oak; but they were much more superb in foliage, having broad glossy leaves like that of the laurel, and tresses of yellow flowers which hung, in the open glades, from the branches to the ground. These mountains passed, we arrived at a region which filled us with utter astonishment. It was an oval valley, surrounded, except at a narrow opening towards the south, by hills, red as the purest vermilion, and evidently crystallized ; for wherever a precipitous chasm appeared—and these chasms were very frequent, and of immense depth—the perpendicular sections presented conglomerated masses of polygon crystals, evenly fitted to each other, and arranged in deep strata, which grew darker in color as they descended to the foundations of the precipices. Innumerable cascades were bursting forth from the breasts of every one of these cliffs, and some so near their summits, and with such great force, as to form arches many yards in diameter. I never was so vividly reminded of Byron's simile, " the tale of the white horse in the Revolution." At the foot of this boundarj' of hills was a perfect zone of woods surrounding the whole valley, which was about eighteen or twenty miles wide, at its greatest breadth, and about thirty in length. Small collections of trees, of every imaginable kind, were scattered about the whole of the luxuriant area; and here our magnifiers blest our panting hopes with specimens of conscious existence. In the shade of the woods on the south-eastern side, we beheld continuous herds of brown quadrupeds, having all the external characteristics of the bison, but more diminutive than any species of the bos genus in our natural history. Its tail is like that of our bos grunniens; but in its semi-circular horns, the hump on its shoulders, and the depth of its dewlap, and the length of its shaggy hair, it closely resembled the species to which I first compared it. It had, however, one widely distinctive feature, which we afterwards found common to nearly every lunar quadruped we have discovered; namely, a remarkable fleshy appendage over the eyes, crossing the whole breadth of the forehead and united to the ears. "We could most distinctly perceive this hairy veil, which was shaped like the upper front outline of a cap known to the ladies as Mary Queen of Scots' cap, lifted and lowered by means of the ears. It immediately occurred to the acute mind of Dr. Herschel, that this was a providential contrivance to protect the eyes of the animal from the great extremes of light and darkness to which all the inhabitants of our side of the moon are periodically subjected. The next animal perceived would be classed on earth as a monster. It was of a bluish lead color, about the size of a goat, with a head and beard like him, and a single horn, slightly inclined forward from the perpendicular. The female was destitute of the horn and beard, but had a much longer tail. It was gregarious, and chiefly abounded on the acclivitous glades of the woods. In elegance of symmetry it rivalled the antelope, and like him it seemed an agile sprightly creature, running with great speed, and springing from the green turf with all the unaccountable antics of a young lamb or kitten. This beautiful creature afforded us the most exquisite amusement. The mimicry of its movements upon our white painted canvass was as faithful and luminous as that of animals -within a few yards of the camera obscura, when seen pictured upon its tympan. Frequently when attempting to put our fingers upon its beard, it would suddenly bound away into oblivion, as if conscious of our earthly impertinence ; but then others would appear, whom we could not prevent nibbling the herbage, say or do what we would to them. On examining the centre of this delightful valley, we found a large branching river, abounding with lovely islands, and water-birds of numerous kinds. A species of grey pelican was the most numerous; but a black and white crane, with unreasonably long legs and bill, were also quite common. We watched their pisciverous experiments a long time, in hopes of catching sight of a lunar fish ; but although we were not gratified in this respect, we could easily guess the purpose with which they plunged their long necks so deeply beneath the water. Near the upper extremity of one of these islands we obtained a glimpse of a strange amphibious creature, of a spherical form, which rolled with great velocity across the pebbly beach, and was lost sight of in the strong current which set off from this angle of the island. We were compelled, however, to leave this prolific valley unexplored, on account of clouds which were evidently accumulating in the lunar atmosphere, our own being perfectly translucent. But this was itself an interesting discovery, for more distant observers had questioned or denied the existence of any humid atmosphere in this planet. The moon being now low on her descent, Dr. Herschel inferred that the increasing refrangibility of her rays would prevent any satisfactory protraction of our labors, and our minds being actually fatigued with the excitement of the high enjoyments we had partaken, we mutually agreed to call in the assistants at the lens, and reward their vigilant attention with congratulatory bumpers of the best " East India Particular." It was not, however, without regret that we left the splendid valley of the red mountains, which, in compliment to the arms of our royal patron, we denominated " the Valley of the Unicorn;" and it may be found in Blnnt'a map, about midway between the Mare Fcecunditatis and the Mare Nectaris.
" The astonishing and beautiful discoveries which we had made during our first night's observation, and the brilliant promise which they gave of the future, rendered every moonlight hour too precious to reconcile us to the deprivation occasioned by these two cloudy evenings; and they were borne with strictly philosophical patience, notwithstanding that our attention was closely occupied in superintending the erection of additional props and braces to the twenty-four feet lens, which we found had somewhat vibrated in a high wind that arose on the morning of the 11th. The night of the 13th (January) was one of pearly purity and loveliness. The moon ascended the firmament in gorgeous splendor, and the stars, retiring around her, left her the unrivalled queen of the hemisphere. This being the last night but one, in the present month, during which we should have an opportunity of inspecting her western limb, on account of the libration in longitude which would thence immediately ensue, Dr. Herschel informed us that he should direct our researches to the parts numbered 2, 11, 26, and 20 in Blunt's map, and which are respectively known in the modern catalogue by the names of Endymion, Cleomedes, Langrenus, and Petavius. To the careful inspection of these, and the regions between them and the extreme western rim, he proposed to devote the whole of this highly favorable night. Taking then our twenty-five miles breadth of her surface upon the field of view, and reducing it to a slow movement, we soon found the first very singularly shaped object of our inquiry. It is a highly mountainous district, the loftier chains of which form three narrow ovals, two of which approach each other in slender points, and are united by one mass of hills of great length and elevation ; thus presenting a figure similar to that of a long skein of thread, the bows of which have been gradually spread open from their connecting knot. The third oval looks also like a skein, and lies as if carelessly dropped from nature's hand in connection with the other; but that which might fancifully be supposed as having formed the second bow of this second skein is cut open, and lies in scattered threads of smaller hills which cover a great extent of level territory. The ground plan of these mountains is so remarkable that it has been accurately represented in almost every lineal map of the moon that has been drawn; and in Blunt's, which is the best, it agrees exactly with my description. "Within the grasp, as it were, of the broken bow of hills last mentioned, stands an oval-shaped mountain, enclosing a valley of an immense area, and having on its western ridge a volcano in a state of terrific eruption. To the north-east of this, across the broken, or what Mr. Holmes called ' the vagabond mountains,' are three other detached oblong formations, the largest and last of which is marked F in the catalogue, and fancifully denominated the Mare Mortuum, or more commonly the ' Lake of Death.' Induced by a curiosity to divine the reason of so sombre a title, rather than by any more philosophical motive, we here first applied our hydro-oxygen magnifiers to the focal image of the great lens. Our twenty-five miles portion of this great mountain circus had comprehended the whole of its area, and of course the two conical hills which rise in it about five miles from each other; but although this breadth of view had heretofore generally presented its objects as if seen within a terrestrial distance of two and a half miles, we were, in this instance, unable to discern these central hills with any such degree of distinctness. There did not appear to be any mist or smoke around them, as in the case of the volcano which we had left in the south-west, and yet they were comparatively indistinct upon the canvass. On sliding in the gas-light lens the mystery was immediately solved. They were old craters of extinct volcanoes, from which still issued a heated though transparent exhalation, that kept them in an apparently oscillatory or trembling motion, most unfavorable to examination. The craters of both these hills, as nearly as we could judge under this obstruction, were about fifteen fathoms deep, devoid of any appearance of fire, and of nearly a yellowish white color throughout. The diameter of each was about nine diameters of our painted circle, or nearly 450 feet; and the width of the rim surrounding them about 1000 feet; yet notwithstanding their narrow mouths, these two chimneys of the subterranean deep had evidently filled the whole area of the valley in which they stood with the lava and ashes with which it was encumbered, and even added to the height, if not indeed caused the existence of the oval chain of mountains which surrounded it. These mountains, as subsequently measured from the level of some large lakes around them, averaged the height of 2,800 feet; and Dr. Herschel conjectured from this and the vast extent of their abutments, which ran for many miles into the country around them, that these volcanoes must have been in full activity for a million of years. Lieut. Drummond, however, rather supposed that the whole area of this oval valley was but the exhausted crater of one vast volcano, which in expiring had left only these two imbecile representatives of its power. I believe Dr. Herschel himself afterwards adopted this probable theory, which is indeed confirmed by the universal geology of the planet. There is scarcely a hundred miles of her surface, not even excepting her largest seas and lakes, in which circular or oval mountainous ridges may not be easily found; and many, very many of these having numerous enclosed hills in full volcanic operation, which are now much lower than the surrounding circles, it admits of no doubt that each of these great formations is the remains of one vast mountain which has burnt itself out, and left only these wide foundations of its ancient grandeur. A direct proof of this is afforded in a tremendous volcano, now in its prime, which I shall hereafter notice. What gave the name of ' The Lake of Death' to the annular mountain I have just described, was, I suppose, the dark appearance of the valley which it encloses, and which, to a more distant view than we obtained, certainly exhibits the general aspect of the waters on this planet. The surrounding country is fertile to excess: between this circle and No. 2 (Endymion), which we proposed first to examine, we counted not less than twelve luxuriant forests, divided by open plains, which waved in an ocean of verdure, and were probably prairies like those of North America. In three of these we discovered numerous herds of quadrupeds similar to our friends the bisons in the Valley of the Unicorn, but of much larger size ; and scarcely a piece of woodland occurred in our panorama which did not dazzle our vision with flocks of white or red birds upon the wing.
" At length we carefully explored the Endymion. We found each of the three ovals volcanic and sterile within ; but, without, most rich, throughout the level regions around them, in every imaginable production of a bounteous soil. Dr. Herschel has classified not less than thirty-eight species of forest trees, and nearly twice this number of plants, found in this tract alone, which are widely different to those found in more equatorial latitudes. Of animals, he classified nine species of mammalia, and five of ovipara. Among the former is a small kind of rein-deer, the elk, the moose, the horned bear, and the biped beaver. The last resembles the beaver of the earth in every other respect than in its destitution of a tail, and its invariable habit of walking upon only two feet. It carries its young in its arms like a human being, and moves with an easy gliding motion. Its huts are constructed better and higher than those of many tribes of human savages, and from the appearance of smoke in nearly all of them, there is no doubt of its being acquainted with the use of fire. Still its head and body differ only in the points stated from that of the beaver, and it was never seen except on the borders of lakes and rivers, in which it has been observed to immerse for a period of several seconds.
" Thirty degrees farther south, in No. 11, or Cleomedes, an immense annular mountain, containing three distinct craters, which have been so long extinguished that the whole valley around them, which is eleven miles in extent, is densely crowded with woods nearly to the summits of the hills. Not a rod of vacant land, except the tops of these craters, could be descried, and no living creature, except a large white bird resembling the stork. At the southern extremity of this valley is a natural archway or cavern, 200 feet high, and 100 wide, through which runs a river which discharges itself over a precipice of grey rock 80 feet in depth, and then forms a branching stream through a beautiful campaign district for many miles. Within twenty miles of this cataract is the largest lake, or rather inland sea, that has been found throughout the seven and a half millions of square miles which this illuminated side of the moon contains. Its width, from east to west, is 198 miles, and from north to south, 266 miles. Its shape, to the northward, is not unlike that of the bay of Bengal, and it is studded with small islands, most of which are volcanic. Two of these, on the eastern 6ide, are now violently eruptive ; but our lowest magnifying power was too great to examine them with convenience, on account of the cloud of smoke and ashes which beclouded our field of view: as seen by Lieut. Drummond, through our reflecting telescope of 2,000 times, they exhibited great brilliancy. In a bay, on the western side of this sea, is an island 55 miles long, of a crescent form, crowded through its entire sweep with the most superb and wonderful natural beauties, both of vegetation and geology. Its hills are pinnacled with tall quartz crystals, of so rich a yellow and orange hue that we at first supposed them to be pointed flames of fire; and they spring up thus from smooth round brows of hills which are covered as with a velvet mantle. Even in the enchanting little valleys of this winding island we could often see these splendid natural spires, mounting in the midst of deep green woods, like church steeples in the vales of Westmoreland. We here first noticed the lunar palm-tree, which differs from that of our tropical latitudes only in the peculiarity of very large crimson flowers, instead of the spadix protruded from the common calyx. We, however, perceived no fruit on any specimens we saw : a circumstance which we attempted to account for from the great (theoretical) extremes in the lunar climate. On a curious kind of tree-melon we nevertheless saw fruit in great abundance, and in every stage of inception and maturity. The general color of these woods was a dark green, though not without occasional admixtures of every tint of our forest seasons. The hectic flush of autumn was often seen kindled upon the cheek of earliest spring; and the gay drapery of summer in some places surrounded trees leafless as the victims of winter. It seemed as if all the seasons here united hands in a circle of perpetual harmony. Of animals we saw only an elegant striped quadruped about three feet high, like a miniature zebra ; which was always in small herds on the green sward of the hills; and two or three kinds of long-tailed birds, which we judged to be golden and blue pheasants. On the shores, however, we saw countless multitudes of univalve shell-fish, and among them some huge flat ones, which all three of my associates declared to be cornu ammonse; and I confess I was here compelled to abandon my sceptical substitution of pebbles. The cliffs all along these shores were deeply undermined by tides ; they were very cavernous, and yellow crystal stalactites larger than a man's thigh were shooting forth on all sides. Indeed every rood of this island appeared to be crystallized ; masses of fallen crystals were found on every beach we explored, and beamed from every fractured headland. It was more like a creation of an oriental fancy than a distant variety of nature brought by the powers of science to ocular demonstration. The striking dissimilitude of this island to every other we had found on these waters, and its near proximity to the main land, led us to suppose that it must at some time have been a part of it; more especially as its crescent bay embraced the first of a chain of smaller ones which ran directly thither. The first one was a pure quartz rock, about three miles in circumference, towering in naked majesty from the blue deep, without either shore or shelter. But it glowed in the sun almost like a sapphire, as did all the lesser ones of whom it seemed the king. Our theory was speedily confirmed; for all the shore of the main land was battlemented and spired with these unobtainable jewels of nature ; and as we brought our field of view to include the utmost rim of the illuminated boundary of the planet, we could still see them blazing in crowded battalions as it were, through a region of hundreds of miles. In fact we could not conjecture where this gorgeous land of enchantment terminated; for as the rotary motion of the planet bore these mountain summits from our view, we became further remote from their western boundary. "After a short delay in advancing the observatory upon the levers, and in regulating the lens, we found our object and surveyed it. It was a dark narrow lake seventy miles long, bounded, on the east, north, and west, by red mountains of the same character as those surrounding the Yalley of the Unicorn, from which it is distant to the south-west about 160 miles. This lake, like that valley, opens to the south upon a plain not more than ten miles wide, which is here encircled by a truly magnificent amphitheatre of the loftiest order of lunar hills. For a semicircle of six miles these hills are riven, from their brow to their base, as perpendicularly as the outer walls of the Colosseum at Rome ; but here exhibiting the sublime altitude of at least two thousand feet, in one smooth unbroken surface. How nature disposed of the huge mass which she thus prodigally carved out, I know not; but certain it is that there are no fragments of it left upon the plain, which is a declivity without a single prominence except a billowy tract of woodland that runs in many a wild vagary of breadth and course to the margin of the lake. The tremendous height and expansion of this perpendicular mountain, with its bright crimson front contrasted with the fringe of forest on its brow, and the verdure of the open plain beneath, filled our canvass with a landscape unsurpassed in unique grandeur by any we had beheld. Our twenty-five miles perspective included this remarkable mountain, the plain, a part of the lake, and the last graduated summits of the range of hills by which the latter is nearly surrounded. "We ardently wished that all the world could view a scene so strangely grand, and our pulse beat high with the hope of one day exhibiting it to our countrymen in some part of our native land. But we were at length compelled to destroy our picture, as a whole, for the purpose of magnifying its parts for scientific inspection. Our plain was of course immediately covered with the ruby front of this mighty amphitheatre, its tall figures, leaping cascades, and rugged caverns. As its almost interminable sweep was measured off upon the canvass, we frequently saw long lines of some yellow metal hanging from the crevices of the horizontal strata in wild net-work, or straight pendant branches. We of course concluded that this was virgin gold, and we had no assay-master to -prove to the contrary. On searching the plain, over which we had observed the woods roving in all the shapes of clouds in the sky, we were again delighted with the discovery of animals. The first observed was a quadruped with an amazingly long neck, head like a sheep, bearing two long spiral horns, white as polished ivory, and standing in perpendicular parallel to each other. Its body was like that of the deer, but its fore-legs were most disproportionally long, and its tail, which was very bushy and of a snowy whiteness, curled high over its rump, and hung two or three feet by its side. Its colors were bright bay and white in brindled patches, clearly defined, but of no regular form. It was found only in pairs, in spaces between the woods, and we had no opportunity of witnessing its speed or habits. But a few minutes only elapsed before three specimens of another animal appeared, so well known to us all that we fairly laughed at the recognition of so familiar an acquaintance in so distant a land. They were neither more nor less than three good large sheep, which would not have disgraced the farms of Leicestershire, or the shambles of Leadenhall-market. With the utmost scrutiny, we could find no mark of distinction between these and those of our native soil; they had not even the appendage over the eyes, which I have described as common to lunar quadrupeds. Presently they appeared in great numbers, and on reducing the lenses, we found them in flocks over a great part of the valley. I need not say how desirous we were of finding shepherds to these flocks, and even a man with blue apron and rolled up sleeves would have been a welcome sight to us, if not to the sheep; but they fed in peace, lords of their own pastures, without either protector or destroyer in human shape. "We at length approached the level opening to the lake, where the valley narrows to a mile in width, and displays scenery on both sides picturesque and romantic beyond the powers of a prose description. Imagination, borne on the wings of poetry, could alone gather similes to portray the wild sublimity of this landscape, where dark behemoth crags stood over the brows of lofty precipices, as if a rampart in the sky ; and forests seemed suspended in mid air. On the eastern side there was one soaring crag, crested with trees, which hung over in a curve like three-fourths of a Gothic arch, and being of a rich crimson color, its effect was most strange upon minds unaccustomed to the association of such grandeur with such beauty. "But whilst gazing upon them in a perspective of about half a mile, we were thrilled with astonishment to perceive four successive flocks of large winged creatures, wholly unlike any kind of birds, descend with a slow even motion from the cliffs on the western side, and alight upon the plain. They were first noticed by Dr. Herschel, who exclaimed, ' Now, gentlemen, my theories against your proofs, which you have often found a pretty even bet, we have here something worth looking at: I was confident that if ever we found beings in human shape, it would be in this longitude, and that they would be provided by their Creator with some extraordinary powers of locomotion: first exchange for my number D.' This lens being soon introduced, gave us a fine half-mile distance, and we counted three parties of these creatures, of twelve, nine, and fifteen in each, walking erect towards a small wood near the base of the eastern precipices. Certainly they were like human beings, for their wings had now disappeared, and their attitude in walking was both erect and dignified. Having observed them at this distance for some minutes, we introduced lens H z which brought them to the apparent proximity of eighty yards; the highest clear magnitude we possessed until the latter end of March, when we effected an improvement in the gas-burners. About half of the first party had passed beyond our canvass; but of all the others we had a perfectly distinct and deliberate view. They averaged four feet in height, were covered, except on the face, with short and glossy copper-colored hair, and had wings composed of a thin membrane, without hair, lying snugly upon their backs, from the top of the shoulders to the calves of the legs. The face, which was of a yellowish flesh color, was a slight improvement upon that of the large orang outang, being more open and intelligent in its expression, and having a much greater expansion of forehead. The mouth, however, was very prominent, though somewhat relieved by a thick beard upon the lower jaw, and by lips far more human than those of any species of the simia genus. In general symmetry of body and limbs they were infinitely superior to the orang outang; so much so, that, but for their long wings, Lieut. Drumrnond said they would look as well on a parade ground as some of the old cockney militia! The hair on the head was a darker color than that of the body, closely curled, but apparently not woolly, and arranged in two curious semicircles over the temples of the forehead. Their feet could only be seen as they were alternately lifted in walking; but, from what we could see of them in so transient a view, they appeared thin, and very protuberant at the heel. "Whilst passing across the canvass, and whenever we afterwards saw them, these creatures were evidently engaged in conversation ; their gesticulation, more particularly the varied action of their hands and arms, appeared impassioned and emphatic. We hence inferred that they were rational beings, and although not perhaps of so high an order as others which we discovered the next month on the shores of the Bay of Rainbows, that they were capable of producing works of art and contrivance. The next view we obtained of them was still more favorable. It was on the borders of a little lake, or expanded stream, which we then for the first time perceived running down the valley to a large lake, and having on its eastern margin a small wood. "Some of these creatures had crossed this water and were lying like spread eagles on the skirts of the wood. We could then perceive that they possessed wings of great expansion, and were similar in structure to those of the bat, being a semi-transparent membrane expanded in curvilineal divisions by means of straight radii, united at the back by the dorsal integuments. But what astonished us very much was the circumstance of this membrane being continued, from the shoulders to the legs, united all the way down, though gradually decreasing in width. The wings seemed completely under the command of volition, for those of the creatures whom we saw bathing in the water, spread them instantly to their full width, waved them as ducks do theirs to shake off the water, and then as instantly closed them again in a compact form. Our further observation of the habits of these creatures, who were of both sexes, led to results so very remarkable, that I prefer they should first be laid before the public in Dr. Herschel's own work, where I have reason to know they are fully and faithfully stated, however incredulously they may be received.— ***** three families then almost simultaneously spread their wings, and were lost in the dark confines of the canvass before we had time to breathe from our paralyzing astonishment. We scientifically denominated them the Yespertilio-homo, or man-bat; and they are doubtless innocent and happy creatures, notwithstanding that some of their amusements would but ill comport with our terrestrial notions of decorum. The valley itself we called the Kuby Colosseum, in compliment to its stupendous southern boundary, the six mile sweep of precipices two thousand feet high. And the night, or rather morning, being far advanced, we postponed our tour to Petavius (No. 20), until another opportunity." We have, of course, faithfully obeyed Dr. Grant's private injunction to omit those highly curious passages in his correspondence which he wished us to suppress, although we do not perceive the force of the reason assigned for it. It is true, the omitted paragraphs contain facts which would be wholly incredible to readers who do not carefully examine the principles and capacity of the instrument with which these marvellous discoveries have been made ; but so will nearly all of those which, he has kindly permitted us to publish; and it was for this reason that we considered the explicit description which we have given of the telescope so important a preliminary. From these, however, and other prohibited passages, which will be published by Dr. Herschel, with the certificates of the civil and military authorities of the colony, and of several Episcopal, "Wesleyan, and other ministers, who, in the month of March last, were permitted, under stipulation of temporary secrecy, to visit the observatory, and become eye-witnesses of the wonders which they were requested to attest, we are confident his forthcoming volumes will be at once the most sublime in science, and the most intense in general interest, that ever issued from the press.
" Next to this, the most remarkable formation in this ocean is a strikingly brilliant annular mountain of immense altitude and circumference, standing 330 miles E.S.E., commonly known as Aristarchus (No. 12), and marked in the chart as a large mountain, with a great cavity in its centre. That cavity is now, as it was probably wont to be in ancient ages, a volcanic crater, awfully rivalling our Mounts Etna and Vesuvius in the most terrible epochs of their reign. Unfavorable as the state of the atmosphere was to close examination, we could easily mark its illumination of the water over a circuit of sixty miles. If we had before retained any doubt of the power of lunar volcanoes to throw fragments of their craters so far beyond the moon's attraction that they would necessarily gravitate to this earth, and thus account for the multitude of massive aerolites TM7- which have fallen and been found upon our surface, the view which we had of Aristarchus would have set our scepticism forever at rest. This mountain, however, though standing 300 miles in the ocean, is not absolutely insular, for it is connected with the main land by four chains of mountains, which branch from it as a common centre. The next great ocean is situated on the western side of the meridian line, divided nearly in the midst by the line of the equator, and is about 900 miles in north and south extent. It is marked 0 in the catalogue, and was fancifully called the Mare Tranquillitatis. It is rather two large seas than one ocean, for it vision»- is narrowed just under the equator by a strait not more than 100 miles wide. Only three annular islands of a large size, and quite detached from its shores, are to be found within it; though several sublime volcanoes exist on its northern boundary; one of the most stupendous of which is within 120 miles of the Mare Nectaris before mentioned. Immediately contiguous to this second great ocean, and separated from it only by a concatenation of dislocated continents and islands, is the third, marked D, and known as the Mare Serenitatis. It is nearly square, being about 330 miles in length and width. But it has one most extraordinary peculiarity, which is a perfectly straight ridge of hills, certainly not more than live miles wide, which starts in a direct line from its southern to its northern shore, - dividing it exactly in the midst. This singular ridge is perfectly sui generis, being altogether unlike any mountain chain either on this earth or on the moon itself. It is so very keen, that its great concentration of the solar light renders it visible to small telescopes; but its character is so strikingly peculiar, that we could not resist the temptation to depart from our predetermined adherence to a general survey, and examine it particularly. Our lens G- x brought it within the small distance of 800 yards, and its whole width of four or five miles snugly within that of our canvass. Nothing that we had hitherto seen more highly excited our astonishment. Believe it or believe it not, it was one entire crystallization!—its edge, throughout its whole length of 340 miles, is an acute angle of solid quartz crystal, brilliant as a piece of Derbyshire spar just brought from a mine, and containing scarcely a fracture or a chasm from end to end ! What a prodigious influence must our thirteen times larger globe have exercised upon this satellite, when an embryo in the womb of time, the passive subject of chemical affinity! We found that wonder and astonishment, as excited by objects in this distant world, were but modes and attributes of ignorance, which should give place to elevated expectations, and to reverential confidence in the illimitable power of the Creator. "The dark expanse of waters to the south of the first great ocean has often been considered a fourth; but we found it to be merely a sea of the first class, entirely surrounded by land, and much more encumbered with promontories and islands than it has been exhibited in any lunar chart. One of its promontories runs from the vicinity of Pitatus (No. 19), in a slightly curved and very narrow line, to Bullialdus (No. 22), which is merely a circular head to it, 264 miles from its starting place. This is another mountainous ring, a marine volcano, nearly burnt out, and slumbering upon its cinders. But Pitatus, standing upon a bold cape of the southern shore, is apparently exulting in the might and majesty of its fires. The atmosphere being now quite free from vapor, we introduced the magnifiers to examine a large bright circle of hills which sweep close beside the western abutments of this flaming mountain. The hills were either of snow-white marble or semi-transparent crystal, we could not distinguish which, and they bounded another of those lovely green valleys, which, however monotonous in my descriptions, are of paradisaical beauty and fertility, and like primitive Eden in the bliss of their inhabitants. Dr. Herschel here again predicated another of his sagacious theories. He said the proximity of the flaming mountain, Bullialdus, must be so great a local convenience to dwellers in this valley during the long periodical absence of solar light, as to render it a place of populous resort for the inhabitants of all the adjacent regions, more especially as its bulwark of hills afforded an infallible security against any volcanic eruption that could occur. "We therefore applied our full power to explore it, and rich indeed was our reward. "The very first object in this valley that appeared upon our canvass was a magnificent work of art. It was a temple—a fane of devotion, or of science, which, when consecrated to the Creator, is devotion of the loftiest order; for it exhibits his attributes purely free from the masquerade, attire, and blasphemous caricature of controversial creeds, and has the seal and signature of his own hand to sanction its aspirations. It was an equitriangular temple, built of polished sapphire, or of some resplendent blue stone, which, like it, displayed a myriad points of golden light twinkling and scintillating in the sunbeams. Our canvass, though fifty feet in diameter, was too limited to receive more than a sixth part of it at one view, and the first part that appeared was near the centre of one of its sides, being three square columns, six feet in diameter at its base, and gently tapering to a hight of seventy feet. The intercolumniations were each twelve feet. We instantly reduced our magnitude, so as to embrace the whole structure in one view, and then indeed it was most beautiful. The roof was composed of some yellow metal, and divided into three compartments, which were not triangular planes inclining to the centre, but subdivided, curbed, and separated, so as to present a mass of violently agitated flames rising from a common source of conflagration and terminating in wildly waving points. This design was too manifest, and too skilfully executed to be mistaken for a single moment. Through a few openings in these metallic flames we perceived a large sphere of a darker kind of metal nearly of a clouded copper color, which they enclosed, and seemingly raged around, as if hieroglyphically consuming it. This was the roof; but upon each of the three corners there was a small sphere of apparently the same metal as the large centre one, and these rested upon a kind of cornice, quite new in any order of architecture with which we are acquainted, but nevertheless exceedingly graceful and impressive. It was like a half-opened scroll, swelling off boldly from the roof, and hanging far over the walls in several convolutions. It was of the same metal as the flames, and on each side of the building it was open at both ends. The columns, six on each side, were simply plain shafts, without capitals or pedestals, or any description of ornament; nor was any perceived in other parts of the edifice. It was open on each side, and seemed to contain neither seats, altars, nor offerings ; but it was a light and airy structure, nearly a hundred feet high from its white glistening floor to its glowing roof, and it stood upon a round green eminence on the eastern side of the valley. "We afterwards, however, discovered two others, which were in every respect fac-similes of this one; but in neither did we perceive any visitants besides flocks of wild doves which alighted upon its lustrous pinnacles. Had the devotees of these temples gone the way of all living, or were the latter merely historical monuments ? What did the ingenious builders mean by the globe surrounded by flames? Did they by this record any past calamity of their world, or predict any future one of ours? I by no means despair of ultimately solving not only these but a thousand other questions which present themselves respecting the objects in this planet; for not the millionth part of her surface has yet been explored, and we have been more desirous of collecting the greatest possible number of new facts, than of indulging in speculative theories, however seductive to the imagination. without exulting in my knowledge of its truth." With the careful inspection of this instructive valley, and a scientific classification of its animal, vegetable, and mineral productions, the astronomers closed their labors for the night; labors rather mental than physical, and oppressive, from the extreme excitement which they naturally induced. A singular circumstance occurred the next day, which threw the telescope quite out of use for nearly a week, by. which time the moon could be no longer observed that month. The great lens, which was usually lowered during the day, and placed horizontally, had, it is true, been lowered as usual, but had been inconsiderately left in a perpendicular position. Accordingly, shortly after sunrise the next morning, Dr. Herschel and his assistants, Dr. Grant and Messrs. Drummond and Home, who slept in a bungalow erected a short distance from the observatory circle, were awakened by the loud shouts of some Dutch farmers and domesticated Hottentots (who were passing with their oxen to agricultural labor), that the "big house" was on fire! Dr. Herschel leaped out of bed from his brief slumbers, and, sure enough, saw his observatory enveloped in a cloud of smoke. Luckily it had been thickly covered, within and without, with a coat of Roman plaster, or it would inevitably have been destroyed with all its invaluable contents; but, as it was, a hole fifteen feet in circumference had been burnt completely through the " reflecting chamber," which was attached to the side of the observatory nearest the lens, through the canvass field on which had been exhibited so many wonders that will ever live in the history of mankind, and through the outer wall. So fierce was the concentration of the solar rays through the gigantic lens, that a clump of trees standing in a line with them was set on fire, and the plaster of the observatory walls, all round the orifice, was vitrified to blue glass. The lens being almost immediately turned, and a brook of water being within a few hundred yards, the fire was soon extinguished, but the damage already done was not inconsiderable. The microscope lenses had fortunately been removed for the purpose of being cleaned, but several of the metallic reflectors were so fused as to be rendered useless. Masons and carpenters were procured from Cape Town with all possible dispatch, and in about a week the whole apparatus was again prepared for operation. * * * * "It was not until the new moon of the month of March, that the weather proved favorable to any continued series of lunar observations; and Dr. Herschel had been too enthusiastically absorbed in demonstrating his brilliant discoveries in the southern constellations, and in constructing tables and catalogues of his new stars, to avail himself of the few clear nights which intervened. "On one of these, however, Mr. Drummond, myself, and Mr. Holmes, made those discoveries near the Bay of Rainbows, to Which I have somewhere briefly alluded. The bay thus fancifully denominated is a part of the northern boundary of the first great ocean which I have lately described, and is marked in the chart with the letter O. The tract of country which we explored on this occasion is numbered 6, 5, 8, 7, in the catalogue, and the chief mountains to which these numbers are attached are severally named Atlas, Hercules, Heraclides Verus, and Heraclides Falsus. Still farther to the north of these is the island circle called Pythagoras, and numbered 1; and yet nearer the meridian line is the mountainous district marked K, and called the Land of Drought, and Q, the Land of Hoar Frost; and certainly the name of the latter, however theoretically bestowed, was not altogether inapplicable, for the tops of its very lofty mountains were evidently covered with snow, though the valleys surrounding them were teeming with the luxuriant fertility of midsummer. But the region which we first particularly inspected was that of Heraclides Falsus (No. 7), in which we found several new specimens of animals, all of which were horned and of a white or grey color ; and the remains of three ancient triangular temples which had long been in ruins. We thence traversed the country southeastward, until we arrived at Atlas (No. 6), and it was in one of the noble valleys at the foot of this mountain that we found the very superior species of the Vespertilio-homo. In stature they did not exceed those last described, but they were of infinitely greater personal beauty, and appeared in our eyes scarcely less lovely than the general representations of angels by the more imaginative schools of painters. Their social economy seemed to be regulated by laws or ceremonies exactly like those prevailing in the Vale of the Triads, but their works of art were more numerous, and displayed a proficiency of skill quite incredible to all except actual observers. I shall, therefore, let the first detailed account of them appear in Dr. Herschel's authenticated natural history of this planet." Opinions of the American Press Respecting the Foregoing Discovery. "Herschel's Great Discoveries.—We are too much pleased with the remarks of the sensible, candid, and scientific portions of the public press upon the extracts which we have published relative to these wonders of the age, to direct our attention very severely to-day to that sceptical class of our cotemporaries to whom none of these attributes can be ascribed. Consummate ignorance is always incredulous to the higher order of scientific discoveries, because it cannot possibly comprehend them. Its mental thorax is quite capacious enough to swallow any dogmas, however great, that are given upon the authority of names; but it strains most perilously to receive the great truths of reason and science. We scarcely ever knew a very ignorant person who would believe in the existence of those myriads of invisible beings which inhabit a drop of water, and every grain of dust, until he had actually beheld them through the microscope by which they are developed. Yet these very persons will readily believe in the divinity of Matthias the prophet, and in the most improbable credenda of extravagant systems of faith. The Journal of Commerce, for instance, says it cannot believe in these great discoveries of Dr. Herschel, yet it believes and defends the innocence of the murderer Avery. These who in a former age imprisoned Galileo for asserting his great discoveries with the telescope, and determined upon sentencing him to be burnt alive, nevertheless believed that Simon Magus actually flew in the air by the aid of the devil, and that when that aid was withdrawn he fell to the ground and broke his neck. The great mechanical discoverer, Worcester, obtained no credence for his theories in his day, though they are now being continually demonstrated by practical operation. Happily, however, those who impudently and ignorantly deny the great discoveries of Herschel, are chiefly to be found among those whose faith or whose scepticism, would never be received as a guide for the opinions of other men. From among that portion of the public press whose intelligence and acquirements render them competent judges of the great scientific questions now before the community, we extract the following frank declarations of their opinions." --New York Sun, Sep. 1, 1835. "No article, we believe, has appeared for years, that will command so general a perusal and publication. Sir John has added a stock of knowledge to the present age that will immortalize his name, and place it high on the page of science." --Daily Advertiser.
" Discoveries In The Moon.—We commence to-day the publication of an interesting article which is stated to have been copied from the Edinburgh Journal of Science, and which made its first appearance here in a contemporary journal of this city. It appears to carry intrinsic evidence of being an authentic document." --Mercantile Advertiser.
" Stupendous Discovery In Astronomy.—We have read with unspeakable emotions of pleasure and astonishment, an article from the last Edinburgh Scientific Journal, containing an account of the recent discoveries of Sir John Herschel at the Cape of Good Hope." --Albany Daily Advertiser. "It is quite proper that the Sun should be the means of shedding so much light on the Moon. That there should be winged people in the Moon does not strike us as more wonderful than the existence of such a race of beings on earth ; and that there does or did exist such a race rests on the evidence of that most veracious of voyagers and circumstantial of chroniclers, Peter Wilkins, whose celebrated work not only gives an account of the general appearance and habits of a most interesting tribe of flying Indians, but also of all those more delicate and engaging traits which the author was enabled to discover by reason of the conjugal relations he entered into with one of the females of the winged tribe. "— N. Y. Evening Post. "We think we can trace in it marks of transatlantic origin."--N. Y. Commercial Advertiser. "The writer (Dr. Andrew Grant) displays the most extensive and accurate knowledge of astronomy, and the description of Sir John's recently improved instruments, the principle on which the inestimable improvements were founded, the account of the wonderful discoveries in the moon, &c, are all probable and plausible, and have an air of intense verisimilitude."--N. Y. Times.
" Great Astronomical Discoveries !—By the late arrivals from England there has been received in this country a supplement to the Edinburgh Journal of Science containing intelligence of the most astounding interest from Prof. Herschel's observatory at the Cape of Good Hope The promulgation of these discoveries creates a new era in astronomy and science generally." --New Yorker. "Our enterprising neighbors of the Sun, we are pleased to learn, are likely to enjoy a rich reward from the late lunar discoveries. They deserve all they receive from the public—'they are worthy.'"--N. Y. Spirit of '76. "After all, however, our doubts and incredulity may be a wrong to the learned astronomer, and the circumstances of this wonderful discovery may be correct. Let us do him justice, and allow him to tell his story in his own way."--N. Y. Sunday News. "The article is said to be an extract from a supplement to the Edinburgh Journal of Science. It sets forth difficulties encountered by Sir John, on obtaining his glass castings for his great telescope, with magnifying powers of 42,000. The account, excepting the magnifying power, has been before published" [i. e., in the Supplement to the Edinburgh Journal of Science.—Ed. Sun],— U. S. Gazette. "It is not worth while for us to express an opinion as to the truth or falsity of the narrative, as our readers can, after an attentive perusal of the whole story, decide for themselves. Whether true or false, the article is written with consummate ability, and possesses intense interest." --Philadelphia Inquirer. "These are but a handful of the innumerable certificates of credence, and of complimentary testimonials with which the universal press of the country is loading our tables. Indeed, we find very few of the public papers express any other opinion. We have named the Journal of Commerce as an exception, because it not only ignorantly doubted the authenticity of the discoveries, but ill-natuiedly said that we had fabricated them for the purpose of making a noise and drawing attention to our paper. "Col. Webb of the Courier and Inquirer has said nothing upon the subject; but he only feels the more, and we are this moment assured that he has made arrangements with the proprietors of the Charleston steam-packets to take the splendid boat William Gibbons of that line, and charter her for the Cape of Good Hope, whither he is going with all his family—including Hoskin. "We yesterday extracted from the celebrated Supplement, a mathematical problem demonstrating an entirely new, and the only true method of measuring the height of the lunar mountains. We were not then aware of its great importance as a demonstration, also, of the authenticity of the great discoveries. But several eminent mathematicians have since called and assured us, that it is the greatest mathematical discovery of the present age. Now, that problem was either predicated by us, or by some other person, who has thereby made the greatest of all modern discoveries in mathematical astronomy. We did not make it, for we know nothing of mathematics whatever; therefore, it was made by the only person to whom it can rationally be ascribed, namely, Herschel the astronomer, its only avowed and undeniable author. "— Editor of the Sun. Source: Richard Adams Locke, The Moon Hoax: or, A Discovery that the Moon Has a Vast Population of Human Beings (New York: William Gowans, 1859).